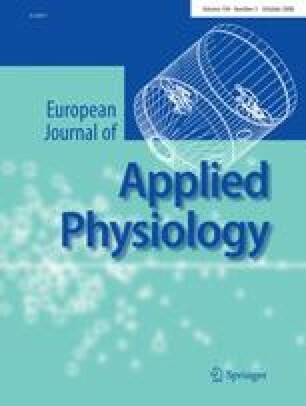 Twitch potentiation in knee extensor (KE) muscles after a 7-s conditioning isometric maximal voluntary contraction (MVC trial), submaximal (25% MVC) voluntary contraction (SVC trial) and submaximal tetanic contraction (25% MVC) induced by percutaneous electrical stimulation at 100 Hz (PES trial) was compared in 12 men aged 19–25 years. Isometric twitch characteristics of KE muscles were measured before conditioning contraction and following 10-min recovery by supramaximal electrical stimulation of the femoral nerve. During MVC trial, twitch peak torque (Pt) potentiated (P < 0.05) immediately after the conditioning contraction with sharp decline during the first and third minute of recovery. No significant potentiation of twitch Pt was observed in SVC trial. During PES trial, twitch Pt was potentiated (P < 0.05) within 3–10 min of recovery. The time-course of isometric twitch was not significantly altered by conditioning contractions. It was concluded that twitch potentiation in the KE muscles differed markedly following the three conditioning contractions.